January 1st, 7 am. The alarm clock goes off and your New Year’s Resolution stares you directly in the face. The reality of that goal you set a few weeks back comes to roost with a jangling of bells, sleep in your eyes, and a feeling of dread. It all sounded so good. Heck, all you had to do was write down the specifics, create some action steps, make it realistic, and magically you would be transported 90 days out with your dream of a new book a reality. Unfortunately, 7 am in the morning comes. Now you have to do something. Usually, you would be able to sleep in, but now that you set this stupid goal, you’ve got to get out of bed and write 1,000 words before 8 am, when you usually would get up. The first day you grudgingly get up and sit in front of the computer. After fifteen minutes of staring at the screen, you start to write. The words come slowly. You’re tired and sleepy. This new goal and habit you’re trying to create are not as easy as the book made it sound. With some willpower, you make it through to 8 am. Now you have to get ready for work. Sum total for your first day, 250 words. As the week progresses, you start to fudge on the wake-up time. You hit the snooze button; then you hit it again. The word count shrinks. You struggle. Friday comes, 1125 words for the week. Not even close to the 5,000 you planned. Next week you struggle again. Then one day, you don’t get up. You’ve got an excuse. A few days later, it’s all over. Goal failure. Maybe next year the book will get written. So what happened here. Why did this well planned SMART Goal fail? I’ve asked myself this many times. How to set goals that don’t fail? The problem is usually an entrenched habit. In this case, the long time practice is going to bed late and sleeping in until 8 am. You set the goal, but you didn’t deal with the habit. What I’ve found from years of research on the subject, is that when a goal conflicts with an existing habit, the goal eventually fails. Willpower may get you through for a limited time, but old habits usually win. So the question is… how to set goals that you can accomplish? With over 80% of New Year’s resolutions ending in failure after a few weeks, is there anything that works? It’s much easier to change an existing habit than creating a new one. Change takes energy, lots of it. So for our example above, if we want to set aside an hour a day to write a new book, we need to find an existing habit to change and do it when we have lots of energy. Obviously, if we are a night owl, getting up early after staying up until one in the morning is not going to work. We don’t have enough energy to work efficiently. Let’s look for an existing habit that we can change at a time that we have enough energy to carry it out. For our night owl who is energized in the evening, it makes sense to look at that time period. After scanning the existing routines, it appears that anything after dinner is fair game. For our example, what current routine would be the easiest to give up at a time that we would have the most energy? I’m not much of a TV watcher, but I would say our Game Show hour would be prime time to change an existing habit. It’s early enough that we will still have plenty of energy and the game shows are not a series that we will miss out on. 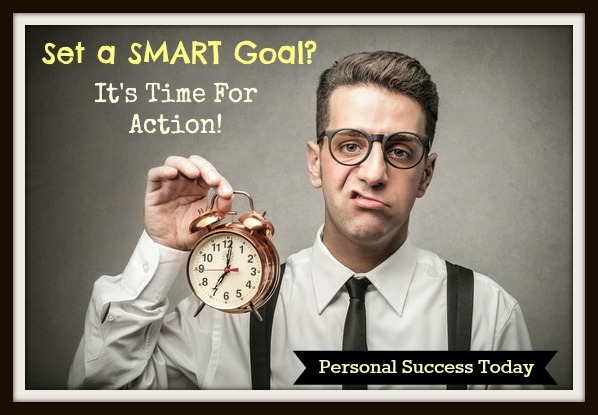 So let’s plan out a full SMARTER Goal written in the first person. Realistic: Typing Speed 40 WPM. 1,000 words per hour is a comfortable pace. As you can see, planning out a new routine around an existing habit will give us a much greater chance of success than trying to create a new habit of getting up early and adding a writing exercise on top of it. Listing out our current routines gives us a chance to pick one that is easy to change. In this case, being an evening person, we’ll have plenty of energy to write, and game shows are not a series, so they won’t be missed. Our probability of success has gone up considerably. Options: If we want to create a new habit of getting up early, it’s going to take a lot of extensive effort. I recommend that you read Michael Hyatt’s insightful post, How To Become a Morning Person or Andy Traub’s book, Early to Rise. It’s better to get the routine down before committing to a new goal during that time period. Overall: In this example above, we have taken a look at a common point of failure for many goals and resolutions. By tying a goal in with an existing habit and creating an updated routine, we raise our chances of success considerably. 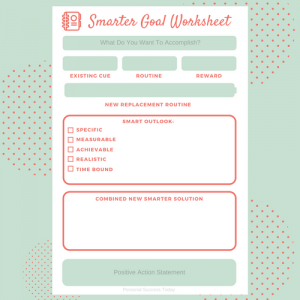 To help you design and set SMARTER Goals I’ve created a SMARTER Goal Worksheet. It’s a free download and prints out on a normal letter sized page. To use you just start at the top and fill in the blanks. What you want to accomplish (goal). 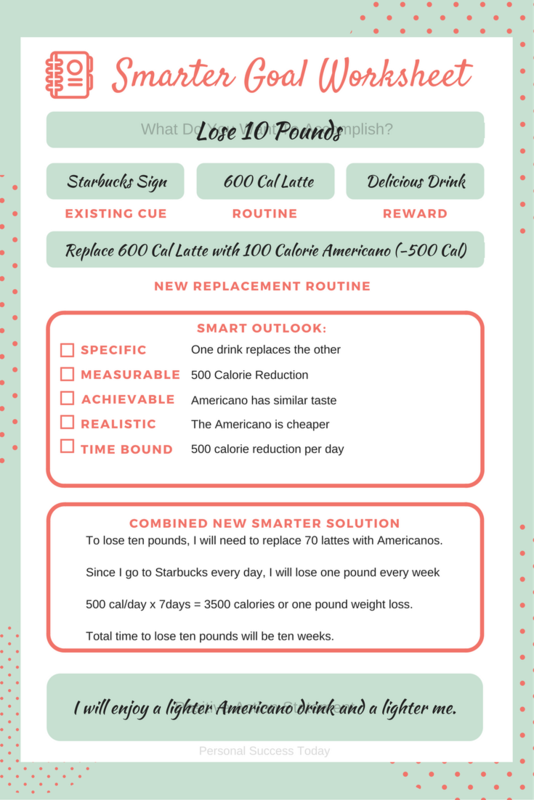 List out a new habit routine that will help you reach your goal. The filled out sheet should look like the one below. Once you have your goal sheet filled in, keep it on your desk or in a prominent place where you can refer to it on a regular basis. 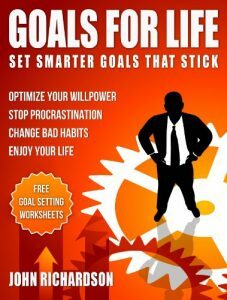 My book has full instructions and examples to help you set SMARTER Goals. What existing habit will you change?